Guitar Note Learning - How Do You Memorize The Notes on A Guitar Neck? Just How Do You Learn The Notes On A Guitar Neck? "Finally! A guitar note learning page with so many ideas, tips and cards that are useable..."
To learn each note on every fret and across all six strings seems quite a difficult task for most students to overcome. Certainly harder than reading guitar tablature I think you'll agree. Because the guitar neck, when compared to a piano for instance, is difficult but there are ways and means of reducing this difficulty quite markedly. "...it is obvious that knowledge of where each guitar note is on an instrument is absolutely basic to any serious study of it. The piano student knows where all the notes are on his instrument in a matter of hours or days, yet guitar students persistently extend this into months and years. 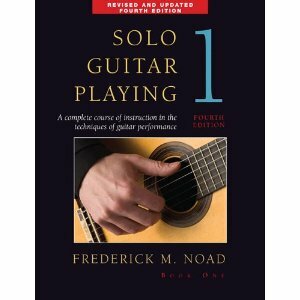 Consequently guitarists tend to lag in musicianship behind other instrumentalists..."
The methods suggested by Mr Noad in the chapter on learning each separate guitar note are sound methods, BUT he generally suggests practicing this away from the guitar i.e. in your mind or imagination. I'm not saying that it's bad advice: however, it's very good advice. There are many more topics covered in the book, and I highly recommend it. I feel that it doesn't go far enough when you consider the different ways in which people learn a new task. I am going to give you some materials to enhance the learning of the fret notes. Generally speaking, it is better learning something new using as many of your senses as possible. That could mean in our case using the visual, auditory and tactile senses. In other words: seeing; hearing; touching. When you add this to your imaginative processes you have a powerful way to commit the learning of each guitar note on the guitar neck, whether a classical guitar or any other type of guitar, to memory. I'll leave out tasting and smelling unless your relationship with your guitar runs much deeper, in which case I think it's beyond the scope of this article! The first method to learn each guitar note is via each vertical fret position and using memory cards. That is I've provided a PDF file (see below this article) for you to download where you can paste each side together and use them in a memory game against yourself or against one of your guitar buddies if you wish. Just download the PDF and print out the cards. Glue back and front together and you're ready to play. It'll help your memorization if you say these out loud. For example, you see a card that says "Fret 3" before you get to "keep" the card you have to recite each guitar note in that fret starting at the 6th string or the 1st string depending on how you want to play the game. Your answer for Fret 3, therefore, could be... "G, C, F, A#, D, G". The second method of learning guitar notes is a little more involved, that is you will use small individual guitar note cards. For example, one side might say... "4th Fret 4th String." and before you turned it over to "keep" you would have to say... "F sharp" and so on for each guitar note on the whole fingerboard board of the guitar from the open strings to the 12th fret. 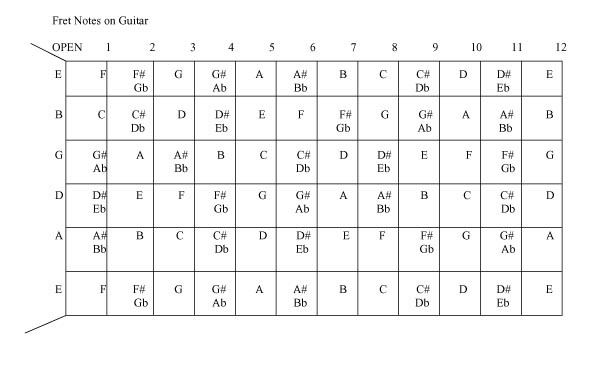 I say to the 12th fret because from that point on the notes are exactly the same except for being an octave higher. 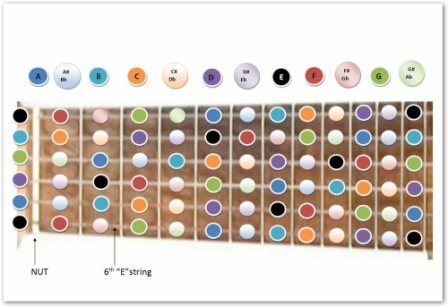 The actual guitar note names are the same, so if you've learnt the notes up to the 12th fret you've really learnt them from the 13th to the 19th, 22nd or even the 24th as some guitars extend. This game is fairly advanced so I'd suggest playing the previous game a whole lot before embarking on this one, but it's really good if you want to consolidate your learning. Don't forget to follow the advice of Fred Noad as his "mental" methods of "Learning By equivalent Notes", "Learning By Fret" and "Transfer of Position" are a great starting point to memorize each guitar note up and down the guitar neck or frets. NOTE: When you print out these P.D.F. sheets for this game, make sure you are careful when aligning them when pasting. If you are not accurate, then the little cards become hard to cut up without snipping off some of the text. I've decided to include another little sheet in the P.D.F. that you can fill in laterally (across each length of string) so that you have another way of consolidating your knowledge. You might want to print out several sheets and either time yourself, your guitar buddy or even your students if you're a teacher of guitar. This is a good way to measure your improvement in terms of speed or facility as well as actually drill practicing that knowledge. An Emu was chasing an Ape with a Drill but tripped over a Garbage can...out popped a Baby eating an Earthworm. Notice the notes of the open strings are capitalized and in orange. If you learn this little story and "see it" in your imagination it becomes easy to remember each guitar note because of the pictures, the bizarreness and the action or movement. Yeah I know it's crazy, but that's the point. Let me explain. Generally speaking, we see pictures in our minds NOT words. Example? If I said to you think of an elephant I'm guessing you're seeing the elephant or part of it but not the word written down., Of course, you could see the word written down if you so desire, but it probably wasn't your brain's first natural instinct to do so and it could be even argued that what you're seeing is a graphic representation of the word anyway. In other words, it's a picture of the word itself. Another way to prove my point is to ask you whether your brain dreams in words or pictures at night. Of course, it's pictures. This principle is nothing new, and I'm not claiming to have made it up. In fact, it's how many of those so-called memory experts remember hundreds of names quickly in say a room full of people. It's just that they're good at using pictures to associate certain facts or names and "pinning" them to people for easy recall. You'll notice that the above story certainly had a "craziness" to it, and that's because it makes your mind sit up and take notice which again enhances the chance of your retaining the information. The third part of the "equation" is that there was a lot of action involved in the particular story. It wasn't a passive, boring retelling. It has movement, and a dynamic quality to help you retain the information in your brain by exciting it and visualizing it in your mind's eye. Don't underestimate the power of this method to help you learn each guitar note on the guitar neck or fret board. I once came up with some of these "stories" with a student for each of the notes on the neck of the guitar up to the 12th fret. In less than two weeks, he'd memorized the whole fret board and could name each note when quizzed on it. 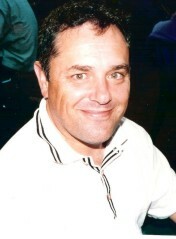 The above "story" was the one we used for the open and 12th frets of his classical guitar. If you want to use this method, I suggest coming up with your own stories because there's nothing better for retaining the information with what your own brain has created. It really is easy if you treat it as a bit of fun and let yourself be creative and "crazy". Now for the P.D.F. file. Just right click on the link below and use the Save Target As function and save to your desktop or folder of your choice. Click the link to open browser in a new window to print your guitar note booklet. To save the files just right click on the PDF icon above and then "Save Target As" (or open into a new window for Google Chrome) to the desired folder for your free guitar lesson on your computer if you're using a Windows operating system. For Mac owners use "Control - Save"
I hope this article and materials are of use to you and that I have inspired you to learn and "unlock" each guitar note on the fret board and to have fun at the same time.